1. 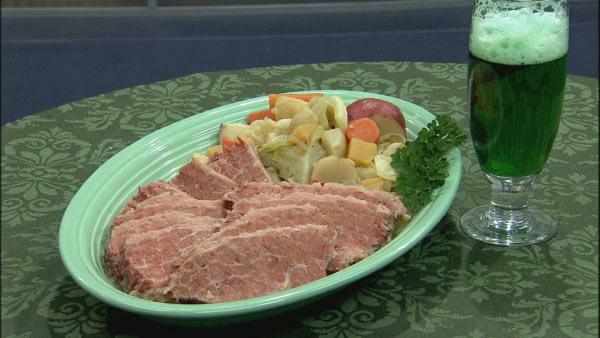 Place corned beef in a large wide pot. Cover with stout and enough water to cover by 1-1/2-inch. 2. Place spices in a piece of cheesecloth and tie into a ball, securing it tightly with string. Add to beef. 3. Bring to a boil. Reduce heat, cover and simmer until tender, about 2-1/2 hours. 5. Add all the vegetables to the cooking liquid. Bring to a boil. Reduce heat and simmer until the vegetables are tender, about 30 minutes. 6. Season vegetables to taste. 7. Using a slotted spoon, transfer vegetables to a serving platter. Keep warm. 8. Return beef to hot liquid until just warmed through, about 5 minutes. 9. Remove meat and cut into 1/4-inch slices (against the grain). Place on platter with vegetables. 10. Serve with mustard and horseradish sauce.